Here are our top 10 ATM safety tips. Please take a moment to read and share with neighbors, friends, and family. 1. Always pay close attention to the ATM and your surroundings. 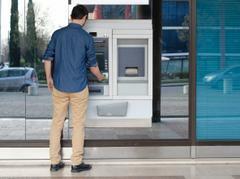 Don’t select an ATM at the corner of a building — corners create a blind spot. Use an ATM located near the center of a building. Do your automated banking in a public, well-lighted location that is free of shrubbery and decorative partitions or dividers. 2. Maintain an awareness of your surroundings throughout the entire transaction. Be wary of people trying to help you with ATM transactions. Be aware of anyone sitting in a parked car nearby. When leaving an ATM, make sure you are not being followed. If you are, drive or walk immediately to a police or fire station, or to a crowded, well-lighted location or business. If you feel you are in danger, call 911! 3. Do not use an ATM that appears unusual looking or offers options with which you are not familiar or comfortable. 4. Do not allow people to look over your shoulder as you enter your PIN. Memorize your PIN; never write it on the back of your card. Do not re-enter your PIN if the ATM eats your card — contact a bank official. 5. Do not wear expensive jewelry or take other valuables to the ATM. This is an added incentive to the assailant. 6. Never count cash at the machine or in public. Wait until you are in your car or another secure place. 7. When using a drive-up ATM, keep your engine running, your doors locked and leave enough room to maneuver between your car and the one ahead of you in the drive-up line. 8. Maintain a supply of deposit envelopes at home or in your car. Prepare all transaction paperwork prior to your arrival at the ATM. This will minimize the amount of time spent at the machine. 9. Closely monitor your bank statements, as well as your balances, and immediately report any problems to your bank. 10. If you are involved in a confrontation with an assailant who demands your money, COMPLY.